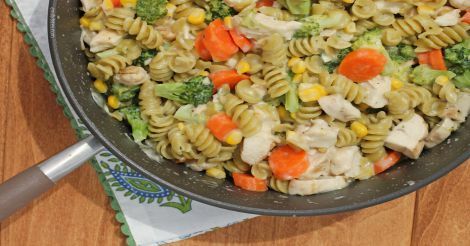 Place the dry pasta in a large saute pan or deep skillet and pour in the water and milk. Stir in the salt and mustard powder and top with the broccoli, carrots and corn. Turn the heat on to medium and stay by the stove, stirring occasionally and watching closely for the contents to begin to simmer. *Pan should remain uncovered. Make sure you don’t wander away, you do not want the contents to boil and spill over or for the milk to get overheated and separate* When you see the liquid start to simmer, reduce the heat to low. Cook the mixture on low, stirring every couple minutes, for 15-20 minutes until the liquid is mostly absorbed. Add the cooked chicken pieces and stir in until well combined and cook for another 1-2 minutes. Remove from heat and stir in the shredded cheese. Cover the pan with a lid for 2-3 minutes until the cheese is melted and then stir until well combined and cheesy. Serve warm.